If you are like me, over the holidays you tend to overeat or eat things that you don't normally eat and end up with indigestion, heartburn or worse. That's why I agreed to review Pepto-Bismol products from Smiley360. I will be compensated for this post. However, it contains my honest opinions. I was sent three products for review--the standard pink bottle of liquid Pepto-Bismol, Pepto-Bismol Chewable Tablets and Pepto-Bismol InstaCool Chewable Tablets. These products all contain Bismuth Subsalicylate and provide relief from 5 symptoms: heartburn, indigestion, nausea, upset stomach and diarrhea. The label claims it relieves travelers' diarrhea, diarrhea and upset stomach due to overindulgence in food and trink including heartburn, indigestion, nausea, gas, belching and fullness. Please read the full warning label before ingesting--there are important warnings to be aware of. Now for my thoughts. Honestly, I think all heartburn type meds have an awful chalky taste and Pepto-Bismol isn't really much different in that aspect. I can tolerate it, though. I grew up with the pink liquid but didn't even realize that Pepto had chewable tablets. Wow--the chewable tablets are much easier to get down. Of course, they have the chalky taste, but not too bad. I especially like the InstaCool. The coolness provides a nice sensation with a minty feel. It is my favorite of the three products. 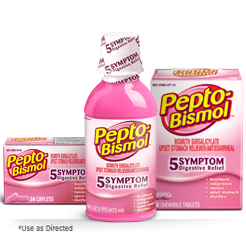 So, if you are looking for some relief when you overindulge, consider the "pink" stuff--Pepto-Bismol. Disclosure: I received product and compensation in exchange for my honest opinion of Pepto-Bismol products.